A while back, many folks around the office were sporting their iPhones in colorful, thin, wrap around cases that they got for free. The case was not super bullet proof or provide extra doors or functionality, they were perfect for around the office where the iPhone needs to be put done on a desk or table… trying to avoid any little scratches or the phone sliding off. The provider of the cases was Zoo Gue. Anyone could visit their site and pay just a couple dollars shipping only to get their choice of color case. 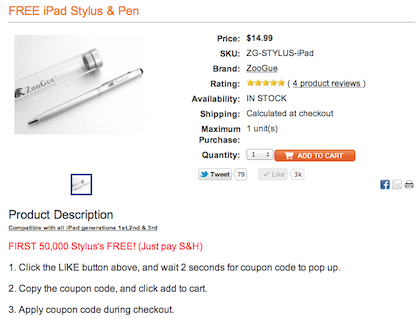 A recent visit back to the site shows the company is offering the same deal, but this time on a stylus. The stylus is actually one end of a twist barrel ink pen. The ink pen works just fine, the stylus tip works! 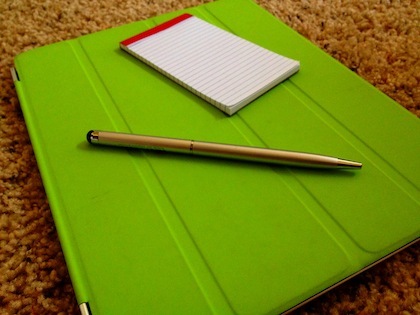 The stylus end is actually shorter than most styluses. Though, it still works very nicely straight on or at an angle. Of course it works on our Classic iPad, iPad2 and the new iPad… as well as our iPhones… iPod Touches… basically all of those iOS devices we carry everyday. To get one, you have to ‘Like’ Zoo Gue on Facebook, but it has to be done through the button on their site. Doing the ‘Like’ that way, will cause a pop up window to appear with your code to use in their shopping cart. That way, you only pay for shipping.